WP Latest posts is the most powerful and unique WordPress news plugin. 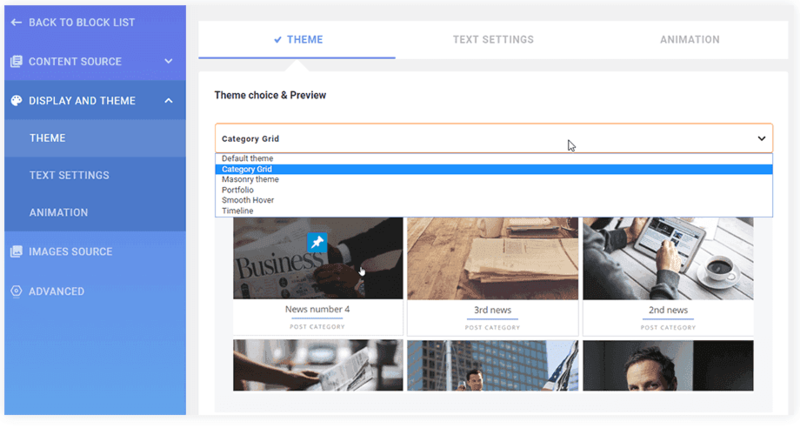 Navigate through the main menu and see how you can display your WordPress latest news with themes included in the pro addon. Got a question? Don’t hesitate to post a pre-sale question on our dedicated forum here. WP latest posts is really flexible as you can configure multiple news element instances with for each, a different configuration. Then you can display each news block in various page and multiple instances on the same page too. The process is quite simple, create news blocks, insert them in your editor or as a widget, you’re done! Plus you can order post by date, title and filter by date. One theme is included in the free version, 4 additional are available in the pro addon with, of course with full mobile support. Each theme can be applied on each news block instance. Click on the buttons below to open a theme demo. Each latest post news block can be displayed as a widget. Select the latest post widget, drag it onto the position you want and select the news block instance to load. Woocommerce is the most popular Ecommerce solution in WordPress, you have definitively used it in the past or will use it some day. As Woocommerce is using custom post type it works perfectly with WP Latest posts. You’ll be able to display your products the way you want by making a selection of the product type and category. All other plugins and themes that are using custom post type are of course compatible. It means that you can load any content from custom post type like WordPress standard posts. Just select the custom post source, for example here, All-in-one event calendar events. 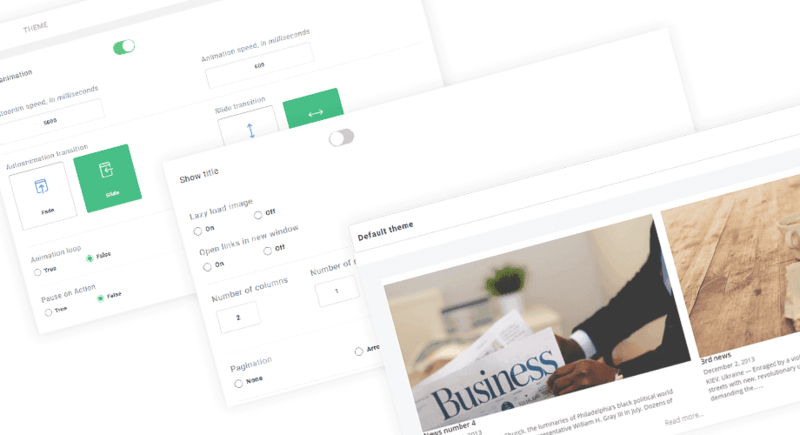 The “Default theme” is the only theme included in the free version, it offers a configurable layout to select the block news elements you want to display. It doesn’t include additional CSS, so it’s perfect to build a custom design. The intro text of your news has several option to be cropped. 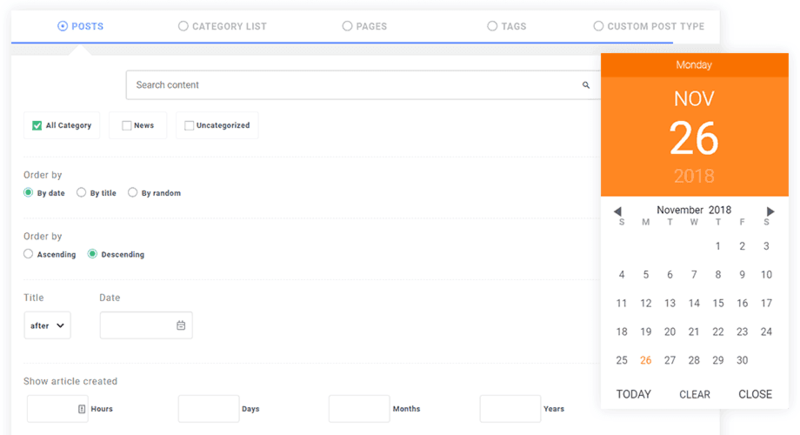 Each themes have it’s own display options like animation or color, number of elements. We’ve made the maximum of options automatically configured but you always keep the control on all elements. WP Latest posts can load field groups and individual fields from ACF that are attached to your content. You also have an option to display/hide the field title. WP Latest Posts is fully integrated with WPML & POLYLANG: Filter and select your content by language in each news block. WP Latest Posts has a dedicated WordPress Multi-site feature. Once the multisite network is activated, you’ll be able to get any content from any multisite of your network and then use all the latest posts power to display your content the way you want. 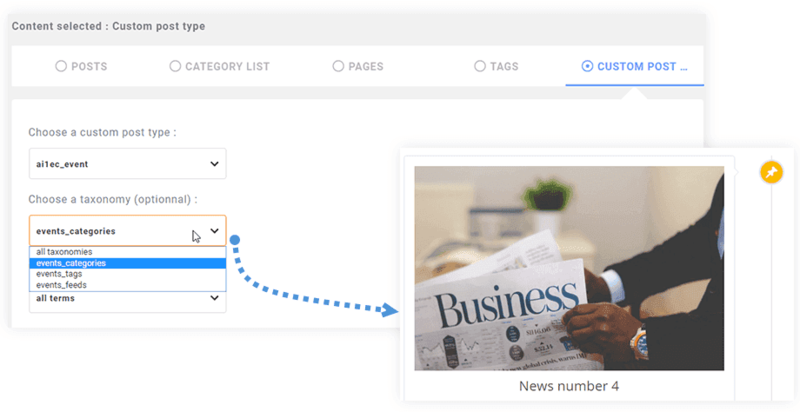 Each news block elements got advanced options regarding image selection, load the first image or the featured one, define size and margins. You have content with no image? define a default one, including a svg logo for example.